Are you looking for new ways to speak directly to high class, middle-aged consumers? Are you looking for new ways to leverage sports without spending large sums of money on official partnership agreements? 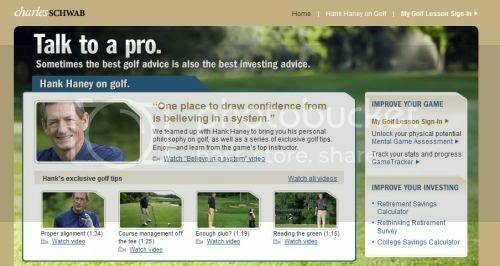 Charles Schwab, the Official Investment Firm of the PGA Tour and the Champions Tour, recently launched a creative messaging campaign that speaks directly to its middle-aged, affluent consumer base. The company created a "Talk to a Pro" campaign that enables consumers to receive a series of tips from Tiger Woods' swing coach Hank Haney. Schwab is supporting the campaign with the messaging philosophy that states "Whether you need help with your investments or your golf game, sometimes it helps to talk to a pro." The exclusive Hank Haney video series features five (5) vignettes detailing Haney's philosophies of golf and seven (7) videos offering exclusive tips for golfers. On the microsite, consumers can also take a Mental Game Assessment and experiment with a variety of investing tools. The firm is supporting the campaign with features on its official Facebook page. Charles Schwab's partnership with Hank Haney serves as a great benchmark for companies looking for new ways to connect with avid sports fans/participants without paying large sums of rights fees. Although Schwab has a significant investment as an Official PGA Tour and Champions Tour sponsor, this effective PSA agreement could have likely been done without an Official affiliation.